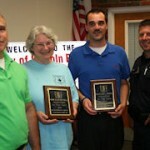 The Lincoln Park Police Department recently honored two Neighborhood Watch coordinators who have built the program up to about 200 members over the past year. Michael Parr, program coordinator, and Mary Ellen Mitchell, volunteer coordinator, were named volunteers of the year for bringing the program back. It had been inactive for some time, said Sgt. Jeff Mueller, the Police Department’s liaison to the group. “They put a lot of their own time and effort into this,” Mueller said. From the safety of their homes, Neighborhood Watch volunteers serve as extra eyes and ears for the police. They are instructed not to confront any suspicious situation or criminal activity themselves, Mueller said. Read the complete article on thenewsherald.com.